Amy's Creative Pursuits: CAS - Yellow! Oh just lovely ! Love this c&s card, so fresh ! so very pretty... love the little felt flowers! thanks so much for playing along with CASology! A quick and easy beauty that is sure to make someone's day! So glad you joined in on the fun at CASology this week! It's beautiful Amy! Loving those colors. Love the colour blocked background - clever idea! Thanks so much for playing along with us at CASology this week! 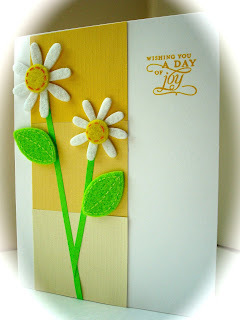 I love the varying shades of yellow and the pretty felt flowers...sweet! Thanks for playing along at CASology! Wonderful card, love the yellow tones and the lovely flower you constructed!